NASA-NOAA's Suomi NPP satellite captured an infrared image of Potential Tropical Cyclone Six that shows the storm is not as "stretched out" as it was the previous day. Despite its lack of organization, a Tropical Storm Warning is in effect for the Cabo Verde Islands of Santiago, Fogo, and Brava. NASA-NOAA's Suomi NPP satellite flew over Potential Tropical Cyclone Six on Aug. 30 at 11:18 p.m. EDT (Aug. 31 at 0318 UTC). The Visible Infrared Imaging Radiometer Suite (VIIRS) instrument aboard NASA-NOAA's Suomi NPP satellite provided a visible image that showed the circulation is gradually becoming less elongated. 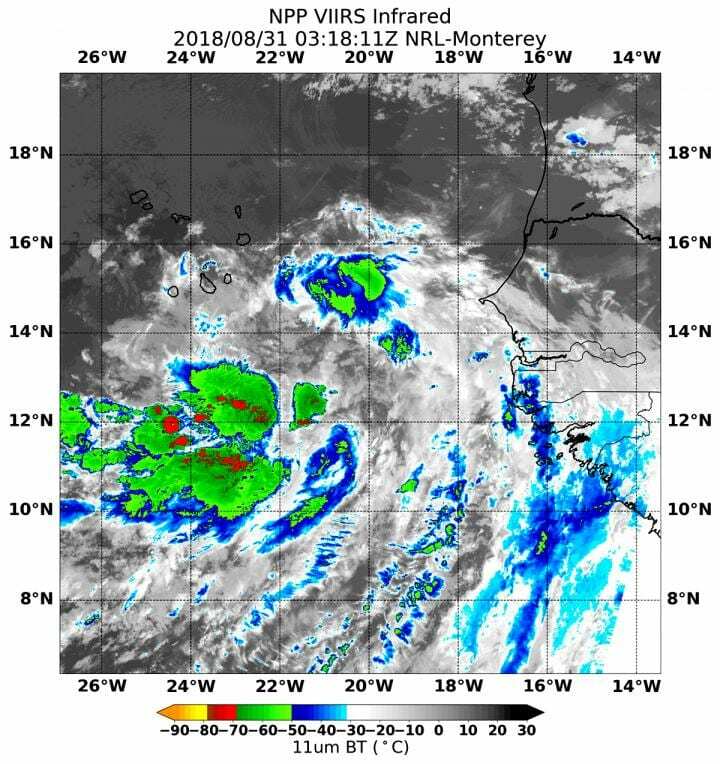 Satellite data revealed that there is still relatively little deep convection near the estimated center of circulation. A few strong storms were found where cloud top temperatures were as cold as or colder than minus 70 degrees Fahrenheit (minus 56.6 degrees Celsius). The National Hurricane Center said that "Most of the convection remains confined to the monsoon trough southwest of the center, where low-level convergence is strongest. Therefore, the system is not quite yet being designated as a tropical cyclone." NHC said "Environmental conditions are favorable for the system to become a tropical cyclone later today."